Crunches, sit-ups, and planks – there are an endless number of exercises claiming to flatten the stomach. But the reality is, there is no workout to tighten loose skin. For these cases, we need a little extra help. Sometimes the skin stretches so much that it can no longer “bounce back” to a contoured shape. A tummy tuck can help get rid of excess skin in the abdomen that no amount of exercise can fix. By removing the excess skin and tightening the abdominal wall, Dr. Brown gives patients the flatter, toned, beautiful stomach. Feel free to contact one of the offices of Dr. Brown in La Jolla, Coronado, and Del MAr to see if you are a qualified candidate. designed specifically to address abdomen contour concerns. Removal of excess skin with an incision by the pubic line and tightening of the abdominal muscles creates a firmer, more youthful and attractive abdomen. And for those who also have stubborn fat deposits around their midsection, Dr. Brown can perform liposuction to create a slimmed hourglass figure. Dr. Brown is specially trained in abdominoplasty and has years of experience performing the latest tummy tuck techniques on patients from all over southern California. Conveniently located in La Jolla, Coronado, and Del Mar it’s easy to request a consultation today! Healthy men and women who have loose skin on their stomach and poor abdominal contour may be good candidates for abdominoplasty. It is a particularly good procedure for women who have given birth or those who have lost a significant amount of weight. The only way to ultimately determine whether or not a patient would benefit from a tummy tuck procedure is by consulting with a board certified plastic surgeon like Dr. Brown. There are three different tummy tuck techniques Dr. Brown can use to help each patient achieve their individual goals. 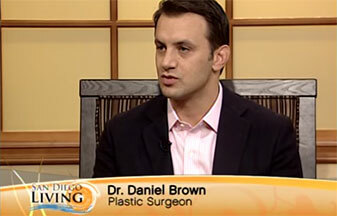 Dr. Brown will help the patient choose the best one for them at the time of the consultation. Mini abdominoplasty removes a moderate amount of skin from the lower abdomen without repositioning belly button. It is specifically designed to help correct the appearance of bulging in the lower part of the abdomen, beneath the belly button. Liposuction is commonly performed as well. Many patients come into the office interested in mini abdominoplasty because it leaves the least amount of scarring. However, this is not the right technique for everybody. Mini abdominoplasty is not a good technique for patients with significant amounts of excess skin on their entire abdomen. This will be better treated by full abdominoplasty. Furthermore, with this procedure, the doctor will not be able to address or tighten the muscles above the belly button. It is a limited procedure designed for a very specific set of circumstances. Full abdominoplasty removes lax skin, and fat if necessary, from above and below belly button and repositions the belly button to a more proportionate spot. This procedure is best at treating patients who have a significant amount of skin laxity on their stomach. Using an incision that runs low from hipbone to hipbone, the doctor can tighten the muscle wall with sutures. This procedure may also be beneficial for patients with stretch marks below the belly button, although stretch mark removal is not guaranteed. A full tummy tuck is the most common type of abdominoplasty. Extended abdominoplasty uses the longest incision of the three techniques, but it will also offer the most comprehensive results. This procedure not only removes skin and repositions the belly button, but it also removes skin from the flanks, or love handles. Using a semi-circumferential incision, Dr. Brown has attained excellent results in performing extended abdominoplasty. This technique is reserved for those who have lost a large amount of weight and need the excess skin removed to show their slim, toned results. A tummy tuck procedure is most frequently performed under general anesthesia as an outpatient procedure, meaning that the patient can return home following surgery. However, the patient will not be able to drive themselves home from the surgery and should make arrangements for an adult to pick them up. Dr. Brown begins most of his abdominoplasties by performing liposuction in order to remove stubborn fat deposits from the abdomen, if necessary. Then, he will make an incision across the lower abdomen, where it will be easily hidden by a swimsuit or underwear. The incision will be predetermined by the technique that the doctor and patient decide is best. Next, the doctor will lift the skin off the abdominal wall in order to access the underlying muscle structure. He will repair the weakened muscle wall by repositioning the muscles and then fixing them in position with internal sutures. If performing a full or extended abdominoplasty, he will reposition the belly button. Finally, he will redrape the skin so that it is flat and smooth over the abdomen, excising any excess skin. He will then close the incision with sutures. Following the procedure, the patient will be taken to a recovery room where they will be monitored until Dr. Brown says they can be released. A tummy tuck is frequently combined with liposuction of the flanks to give patients a more sleek and contoured appearance. However, some patients choose to have liposuction performed in more places than just their flanks during their procedure. Some common areas where liposuction is performed include the upper arms, inner and outer thighs, and knees. A Mommy Makeover usually combines breast enhancement – breast lift, breast augmentation, or breast reduction – with tummy tuck and liposuction. It is called a Mommy Makeover because it is designed to help mother’s regain their pre-baby body. The breasts and the abdomen are the two most difficult areas to tone following pregnancy. Overly stretched skin, for example, cannot be corrected with diet and exercise alone. Following the surgery, patients should expect some bruising and swelling. They may not be able to stand up straight for the first day or two following surgery. This is completely normal. Any discomfort experienced can be managed with a prescription painkiller from Dr. Brown or an over-the-counter medication like Tylenol. However, patients should avoid NSAIDs, including aspirin, ibuprofen, and naproxen. These medications can worsen symptoms. Dr. Brown and his staff will advise the patient on their post-surgical instructions by providing them with detailed information regarding when they can resume work, exercise and other activities, demonstrating use of post-surgical compression garments and drains, and also post-operative massage and scar care. In addition, Dr. Brown or his staff will gladly assist the patient and answer any questions that they may have at any time, and are available to take any calls with further questions during recovery. Patients will notice an immediate change in their appearance following surgery. However, as bruising and swelling diminish over the course of 2-3 weeks, optimal results will begin to appear. Some scarring with this type of procedure is inevitable. However, Dr. Brown does his best to hide the incision in a spot where it is discreet and easily covered. With proper care, the scar will continue to fade with time. In order to maintain results, patients should maintain a stable weight through routine exercise and dieting. Patients should be aware that future pregnancies will also negatively impact their results. Upon arriving at Dr. Brown’s office, the receptionist will first ask the patient to fill out some paperwork. This will include asking about the patient’s medical history. Please make note of any medications or supplements the patient takes, prior surgeries, and illnesses. This is important information for the doctor to have when creating a treatment plan for the patient’s unique case. Please also let the doctor know about any tobacco, alcohol, or drug use, as this will be very important for the patient’s safety and recovery. During the consultation, Dr. Brown will also perform a physical examination in order to determine which tummy tuck technique the patient would benefit from most. He may also take photographs for further analysis. Once Dr. Brown has had the opportunity to examine the particular aspects of the patient’s case, he will be able to provide the patient with a cost estimate. Dr. Brown can itemize the cost, so that the patient understands exactly what he or she is paying for and why. For patients interested in financing, we offer CareCredit. Contact Dr. Brown in southern California today in order to schedule a consultation and get started!